Altar Servers assist the priest in the liturgical services. They set up before a service, participate in the service on the sanctuary, and clear away after the service. 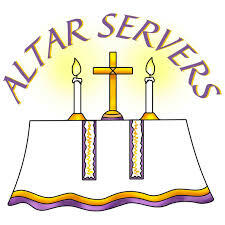 A regular attendance is required, and servers are expected to arrive early for a service and stay behind afterwards. Practices are held before larger celebrations, such as Christmas and Easter. Altar Servers must have made their First Communion. They can then attend a training course with Fr Mark Moran. Courses usually start in September, but anyone interested should contact Fr Mark. New Servers are helped and supported by those with experience. There is a rota of adult Servers for weekday services. A social gathering for Alter Servers is held once a year.